I enjoyed using all of these products especially the face the day tinted face lotion because it blended my skin tone and looked natural.The scents of the body lotion and the lavender wipes weren’t appealing and don’t smell like lavender. I did like how everything felt on my skin though. Meet Isabelle Age 14 Loves Soccer,Soccer and more Soccer her favorite color lime green and loves hot dogs and watermelon. First we did the fresh face cucumber mask,I liked this because it took the redness out of my pimples. Then we used the start fresh facial cleanser it made my face feel amazing,then came the clear facial moisturizer this made my face feel sticky and then tried the tinted face lotion it gave me a lot of coverage lastly I used the moisturizing lip balm I loved it! A plus for me is I have some chin acne and knowing these products don’t have any harsh chemicals was a plus for me. Thanks Willa for creating fantastic products. Meet Madeline age 13 Loves Soccer,Dancing,Singing,Crafts and Pinterest her favorite color is pink and she has a chicken named April and a dog named Henry. I enjoyed all of these products they made my face look clean and Natural,I would repurchase when I run out! The only think I disliked were the scents of the products they weren’t appealing. I love fresh scents on my face and body,also I like light weight face products that don’t have harsh chemicals in it. I dislike greasy face moisturizers. This Friday I am off to a much needed vacation with my Family to the Bahamas. 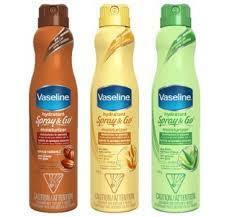 I have used Vaseline Spray and Go Moisturizer for a week now and I wanted to share what I learned. This product is already packed in my suitcase and having 2 daughters I bought them each one. I am hoping for No sunburns, but if it occurs having the moisturizer with Aloe might just do the trick to take out the sting. I will give it a try (Hopefully not for a sunburn cure though) and let you know how it works.